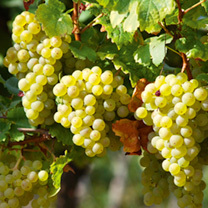 Seedless white grape producing very large bunches of golden-green, delicious dessert grapes. Also suitable for greenhouse or conservatories. Vigorous and heavy cropping. Supplied as a grafted plant in a 3 litre pot. Choose a sunny spot and our variety will provide you with a bountiful crop of delicious grapes! The vine is very attractive too! Ideal climber and suitable for greenhouse or conservatory growing. Prefers full sun or partial shade.